Here’s an overview of Kenya airports. Basically, most international travelers come in through Jomo Kenyatta International Airport in Nairobi. Some international charter companies also come in through the smaller Moi International Airport in Mombasa. Other airports or, often more correct, airstrips are only used for domestic flights with light aircraft. Airport codes mentioned refer to the international IATA code. The only place online where you can compare rates for flights within Kenya, is the Africapoint site. 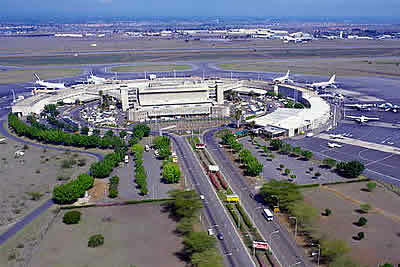 Kenyatta Airport is the 7th most frequented African airport. It served over 4.4 million passengers in 2006. It’s located 15 km south of Nairobi. It’s also a main cargo transport center, as Nairobi is the business center of East Africa. There are three terminals, of which two are for international use. It has good facilities for African standards. Next to an internet café, the airport recently started to provide wireless internet service to airport visitors. It has restaurants, bars and an impressive number of tax-free shops. There’s also a currency exchange desk and an ATM suitable for international bank cards. When changing currency, check you received money well; there have been some reports about rip-offs. You can also get your tourist visa here at the spot for US$50 in cash. The second biggest of the Kenya airports. It grew from a military air base established there during the Second World War.It’s located 10 km north-west of Mombasa. It serves close to 1 million passengers each year. It has three terminals, tax-free shops and some cafetarias. Also here, you can get your tourist visa on the spot for US$50 in cash. There’s a currency exchange office and an ATM (suitable for international bank cards) in the main hall. If you catch your connecting flight to Nairobi here, you will only have to go through customs in Nairobi. Reports of items stolen from luggage are rare, but not non-existent, so better keep valuables in your hand luggage. There’s no bus or matatu line from the airport to Mombasa, so you’ll have to take a taxi. Wilson Airport is located 5 km’s south of Nairobi. It’s essentially an airstrip with a few buildings around it – it has no real terminal. It’s mainly used for domestic flights with light aircraft to Kenya airports like Mombasa, popular places along the coast (Lamu, Malindi) and national parks like Masai Mara, Amboseli and Samburu. There are also flights to Tanzania, Somalia and the Democratic Republic of Kongo. The airport is the base for some Kenyan domestic airlines. Next to tourism, it’s also used for flying health services – among them AMREF – and agricultural transport. Located outside Kisumu, in the far west of Kenya (Nyanza province). It’s the third busiest of the Kenya airports, even though it doesn’t handle any international flights. The number of passengers has quickly grown from 70,000 in 2004 to 240,000 in 2007 and it’s planning to expand. It now has one terminal, a cafeteria, bar and VIP lounge. Mainly Kenya Airways and East African Airways were the first two airlines flying here, but meanwhile they’ve been joined now by several others. It’s possible to fly from Kisumu Airport to various other Kenya airports / airstrips in the national parks in the west and south-west of Kenya. This airport is located 16 km south of Eldoret in the far west of Kenya. It was opened especially for transportation of export products (e.g. flowers, which is a fast growing business in Kenya). But it’s also increasingly used for tourism: the western part of Kenya has started to develop tourism as well. These days there’s a currency exchange desk, cafeteria, VIP lounge and car hire available. In 2005, it was voted the cleanest of the Kenya airports. 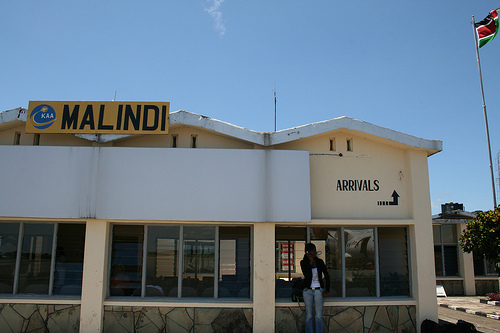 Malindi Airport, located 3 km’s west of Malindi on the coast, has 2 runways and a small terminal. It’s only used for domestic flights, though the airport is trying to get international status, like the big Kenya airports, so that it can receive flights directly from Europe. This one is located at the coast in Manda, just in front of Lamu island which is a popular tourist destination. From the airstrip, you can cross the 800 metres of sea to Lamu island by boat. It has 2 runways but no terminal. Ukunda is another popular tourist destination at the coast, 30 km’s south of Mombasa. It has one runway with a small office building. Many other destinations in Kenya, often in or near national parks frequented by tourists, have an airstrip. These are typically for light aircraft only. They include: Amboseli, Bamburi, Bungoma, Bura, Busia, Elive Springs, Embu, Garba Tula, Garissa, Hola, Homa Bay, Isiolo, Kakamega, Kalokol, Kericho, Kilaguni, Kimwarer, Kisii, Kitale, Kiwayu, Lewa Downs, Lodwar, Loitokitok, Lokichogio, Lakitaung, Loiyangalani, Mackinnon Road, Magadi, Makindu, Mandera, Maralal, Marsabit, Masai Mara (two), Meru, Moyale, Mtito Andei, Naivasha, Nakuru, Nanyuki, Narok, Nyeri, Samburu, Voi, Wajir.